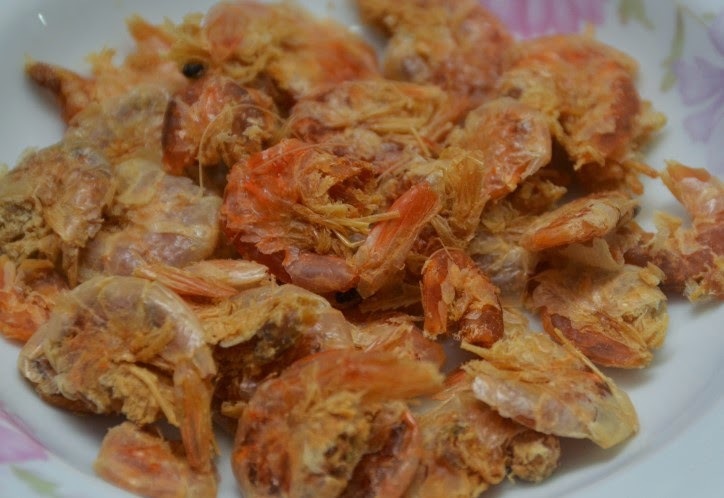 I have eaten a lot of dried shrimp (known as tôm khô in Vietnamese) but never made them myself. My cousin, Ngọc said she always makes them because she can control the saltiness and can make it with much better sanitation than those bought in markets. She explained to me her process when I visited. For her last batch she bought 3.5 kilograms (about 7.7 pounds) of fresh shrimp which yielded 900 grams (about 2 pounds) of dried shrimp. Kiem (my aunt by marriage) explained to me that her sister in Ca Mau also makes tom kho using a similar technique. The method is quite simple and you can make it easily at home. Depending on the source (in Vietnam) often times the fish or seafood are dried outside on the side of the road without any covering in the hot sun. This process can be quite dirty due to dust, flies and other pollution from the environment. Ngọc buys her shrimp at the market, blanches them in slightly salted water until they turn pink, drains them, then she air dries them in a room with good sunlight and away from flies and dust until completely dried. She then puts them in a bag and beats them with a pestle or rolling pin until some of the shells break a little and the heads come off. The heads and any bits of shells can be removed and discarded or saved to make broth another day. The dried shrimp bodies can be stored in an airtight container for many months without refrigeration. These dried shrimp are very tasty and are a good source of calcium. Here is the recipe from cousin Ngoc. 1) Add a little water in a pot over medium high heat. Once the water comes to a boil then add the shrimp and salt. Stir a few times until all the shrimp turn pink. Drain the shrimp as soon as they turn pink. 2) Spread the shrimp in a single layer on plates or baking pans. Dry them in the sun until the shrimp are completely dry. 3) Once the shrimp are dried place them in a bag and beat them until the shells break and the heads come off. Remove the heads and shell bits, either save them for another use or discard. 4) Store the dried shrimp in an airtight container. *Small shrimp would be an excellent choice for making dried shrimp. Make however much you prefer. If you have never made this and would like to try then start with a small amount of shrimp for your initial batch. I just watched a video of shrimp being dried at the side of the road. People walked through it, you could see motor oil stains on the pavement, a motorbike rode right next to it...Yikes! Thank you so much for posting these instructions. After that video, I'd never buy dried shrimp in the market again.